I believe it’s a must that educators, parents to understand first the principles regarding social media first before deciding to embark upon such an endeavor with their students. Remembering parents first are educators at home the issue of social media is one that every parent should be made aware of. Therefore, one of the most applicable lessons for the classroom would be etiquette and the idea that even though people are in cyberspace how one behaves can make or break a reputation. Moreover, concerning a classroom activity –can make or break several reputations; including, the school to which the activity is centered in the classroom. Hence, for this discussion the social media network of choice is Facebook. I decided that Facebook groups are great for teaching any topic. However, the premise for anyone to join a group on the site is a reality unless there is attention to is paid to the groups ‘privacy’ setting. Here one can choose whether the group is open, closed or secret. Hence, in the case of a class then I would choose a private setting so that the name of the group and or participants is not circulated around the site as is typical with open groups where anyone can find it, or anyone can request to join. Secondly, as an educator using social media in the classroom, and, understanding engagement responsible administrators besides the teacher should be selected. For example, since the class is involved then if the teacher is sick then students can continue posting assignments and engaging with students. In fact, this opportunity for educators and students has the makings of a flipped classroom. Hence, in that,ch there might be minimal teacher involvement. If you do decide to use Facebook pages or groups to engage with your students, make sure to customize your privacy settings to that they reflect the amount of information you want to share with people who know you from school. You can also model safe behavior by being careful about what you share online (Facebook, 2016). Accordingly, other uses for Facebook and the classroom can be due to a cause your students have decided to support. For example, feeding the homeless and fund raising efforts for that. Generally, every student can share their page, as well as soliciting parent and community involvement or to gather donations (i.e., blankets, hygiene items, non-perishable food stuff, etc). Finally, self-respect and the respect of others is important when using social media anytime, but most certainly when teaching student values and good citizenship. § Teens are sharing more information about themselves on social media sites than they did in the past. For the five different types of personal information that we measured in both 2006 and 2012, each is significantly more likely to be shared by teen social media users in our most recent survey. § The typical (median) teen Facebook user has 300 friends, while the typical teen Twitter user has 79 followers. § Focus group discussions with teens show that they have waning enthusiasm for Facebook, disliking the increasing adult presence, people sharing excessively, and stressful “drama,” but they keep using it because participation is an important part of overall teenage socializing. § 60% of teen Facebook users keep their profiles private, and most report high levels of confidence in their ability to manage their settings. § Teens take other steps to shape their reputation, manage their networks, and mask information they don’t want others to know; 74% of teen social media users have deleted people from their network or friends list. § On Facebook, increasing network size goes hand in hand with network variety, information sharing, and personal information management. § In broad measures of online experience, teens are considerably more likely to report positive experiences than negative ones. For instance, 52% of online teens say they have had an experience online that made them feel good about themselves (Madden et al, 2013). Therefore, social media and proper knowledge of use thereof promote motivation. The Kellogg Foundation (2002) presents a guide that aims to thoroughly assist in the building up of an organization’s need to improve and or expand on to help the consumer. Hence the model presented by Kellogg includes: (a) Input (b) Activities, (c) Output, (d) Outcomes, and (e) Impact. Inputs include the consumer (s) who in this instance are patients (for example) who utilize the services provided by the organization. Since patients generally use a facility and or referred to a facility for this discussion let us say that the facility to look at is Kindred Healthcare. Kindred Healthcare is the nation’s largest health provider, including, nursing, rehabilitation, assisted living, transitional care, home care, and hospice. Additionally, included in inputs are providers (physicians and nurses), along with payers’ which is inclusive of insurance carriers and state funding, the staff (administrative) and any other technical assistance from external sources. Hence, with the exception of the consumer all other inputs have a hand in meeting the needs of the patient through their system. The activities for providers is that these have an active participation in the reform process. First, one would need to understand that to reform something there was a problem. For example, the Affordable Reform Act ensures that all people in the US can receive adequate and professional healthcare, and along with that the staff includes community decision making (Kellogg, 2004). Outputs for providers include more effective distribution of community care resources. For example, Kindred claims to help their patients recover fully in the best setting suitable for their specific care needs so supposedly they have state of the art facilities and equipment to meet the needs of their consumers, or rather patients. Conversely, the administrative process includes data, policy and advocacy, such as the Kindred Code of Conduct which stress that the company acts with integrity. For outcomes and providers, that is Kindred Health Care should present a comprehensive healthcare delivery system, and the staff the outcomes are community assessment. If the providers do all they say this should lead to improved health status for their patients, and for staff an increased healthcare system efficiency. However, Rowan (2000) explained, “A variety of logic models can be used to describe the plans for implementation and expected outcomes of reform (Rowan, 2000). Consequently, concerning the Kellogg Model the outcome and implementation for that would work well if healthcare companies, their providers, their staff, and any external help they require have strict ethical policies in place. Hence, my analysis here is that though this logic model is sound; and, for the most part, healthcare companies might adhere to it—Kindred hospital has not and has breached all aspects of this model. According to Kellogg (2004), “Outcome approach logic models display the interrelationships between specific program activities and their outcomes”. I thought that I would mention Kindred Hospital here because from what I see of this model there is no adherence to it, that is, if the model is used as a standard for healthcare companies (See: United States Army Disabled Veteran, Sergeant Kericia E. Smith Faces Third Heartbreaking Trauma of Her Life). The welfare to work program, food stamps and other programs have been criticized. Mainly because of stereotypical thinking of a group and partly (also) because of systematic racism. Hence, for the purpose of this discussion, or rather to keep in line with the prompt of choice to say the scenario consists of my leading a government agency compromised of one thousand employees who in their job description assists below poverty level families with no father in the home, single parent homes to see how that program is measuring up. In essence, performance measurement of the welfare to work program, and food stamps back to work initiatives. Ask evaluation questions. According to Harell et al (n.d) a good performance measurement system should begin with clear evaluative questions. Hence, each department should ask those, or ask (a) did the program have the intended impact? -or- (b) did the program have the intended consequences? These two questions along support positive and or negative results (Harrell et al n.d). Performance Monitoring. An important question to ask here concerning those adults who participate in the program (s) would be is there a significant number increase in adults who are successful. For example, one of the programs that support participants going back to work is the JIT program, or rather Just In Time Training. Hence, is there a significant increase of adults who enter the program to learn a particular skill that leave the welfare system? 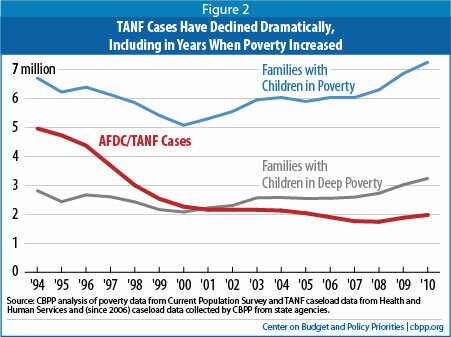 In the graph we see that from the years 1994 to 2010 Families with Children in poverty has increased to 7 million families, however, the estimate of 7 million now includes jobless families with children with AFDC/TANF families at five million over previous years. These indicators reflect that now not only are there generational TANF recipients but also an added measure of people applying for benefits because of loss of employment. Subsequently, the premise here of those who are on welfare is significantly changed. Just in Time Training should give people new skills to return to workforce, or enter the workforce. Also, there is indication that in 2010 the participants in the TANF program dropped significantly to 2 million from 5 million in 1994. Is this because of the welfare to work program or something else? Recent changes to the federal Temporary Assistance for Needy Families (TANF) block grant place new pressures on states to reduce their welfare caseloads and increase the number of families participating in work activities or face financial penalties. At the same time, the new rules make it harder for states to design effective welfare-to-work programs, particularly for those recipients who face the greatest barriers to employment. This policy brief analyzes these challenges in the context of Texas’ welfare program and proposes a set of policy changes designed to help Texas meet the federal requirements while improving outcomes for welfare recipients (Center of public Policy Priorities, 2007). Many people, born and raised in the United States from an early age adhere to and are taught to pledge our allegiance to the flag, and ultimately our allegiance to America –the red, white and blue, that is, the bloodshed, or the honor and purity of white and of an unstained message; and, a color that results in the blue as like streaming tears that come, however, despite that scripture tell us to love our neighbors. Our neighbors as those who reside here with us under God. One Nation undivided, in liberty and justice for all. Hence, it is a must that we all consider to look at this message with the question of how does it happen that bad things are a reality in a country so great as this? How, is it the case, that my country does not have my back, or that, those who live here do not have my best interest and the interest of my family; or the interests of my neighbor at heart? How–can one still love their neighbor, or more specifically, how can my neighbor love me after this, that is, the trauma of the American Dream; and, we ask how does this massacre of U.S. citizenry happen? Sergeant Kericia E. Smith said, “I think you should tell them why you decided to write this story,” and after thinking about it, or rather, after her prompting I have agreed to tell you her story sprinkled with my voice (together we will speak) so that those still asleep abiding in the American Dream can wake up to the travesties of life happening while you are sleeping? I accepted this story without too many reservations, because firstly as Americans we forget that to give does not come in the form of money only, especially when someone faces hardship reaching deep into their heart and soul. I have a heart and to believers, the scriptures tell us “Do not worry…”. Scriptures also tell us that we are to ‘bear one another’s burdens’. Secondly, I have been trained well to understand that as a journalist I am called to be the proverbial ‘watchdog’ of the government and not only the government but those who connect with it to utilize law, and along with this understanding I see that the more professional journalists (some seemingly) care more about their bosses than a common cause among the people; however, I have no boss except the Most Highest God of this universe. Hence, the excuse is taken away of what will I eat or what I will wear. Also, in this stance I as a writer, a mother, wife, grandmother and citizen take the pledge to uplift my neighbor in whichever way I can in honesty and fair dealing and I know that this is the Way, and, I believe scripture is true that He will provide. As a reward, I have been trained to help Sergeant Kericia E. Smith through this circumstance. In any case, I am more grateful in this instance that the Most High chose me to serve her. As a result, Sergeant Smith has created a new phrase calling me her ‘freestyle journalist’. It’s catchy would you agree? We need you to look at this, and notably, this story is for anyone facing the trauma of inadequate care of yourself or a loved one in a hospital and or health care environment, and this message is also helpful for workers who see such horrendous events take place. I received a voicemail from Sergeant Kericia E. Smith, founder and CEO of the Association of Veteran Women, Incorporated [AOVW, Inc.] who (in short) explained that she needed a storyteller. Telling me, she was having some troubles, or rather, that she is having a few heartbreaking moments she wanted me to take a look at. So I do not need to tell you how excited I was and unprepared for even this one. Subsequently, I learned she is named after her best friend pronounced [Ker (ee) sha], and they also share a birth month. Sergeant Smith is an advocate for all women, but mainly for those women who have risked their life serving their country in the Armed Forces. Ultimately, a voice that until now has gone unheard, and, she is a miracle because I believe she is a groundbreaker and a trend setter for many who have lost hope. Hence, she fits the profile of a fighter, and she does not look like what she has been through. Thus, as divine connections happen she and I have worked diligently and have crafted a story that is beneficial for the public to know. However, before I move on, it is important that you know that Kericia initially called several journalists’, major newspapers and magazines to tell her story, but decidedly they were uninterested because there was no response. Kericia says, that someone told her to search out freelance journalists and she found my website The Dailey Grind where my motto is ‘Reporting what the news won’t.’ She told me, that she prayed and left a message, and I am the only one to respond to help her. Therefore, I tell you Kericia this is it—the time is now and that God has prepared you for such a time as this! In the words of Ms. Shirley Chisolm, Kericia has decided that she is “Unbought and Unbossed!” Essentially, she says “My misery has become my ministry!” I agree. I am Sergeant Kericia E. Smith. I am a disabled veteran diagnosed with Post Traumatic Stress Disorder [PTSD], a trauma I acquired while on active duty. I was also my best friend’s primary caregiver, and is the reason why I want to tell you the story about my best friend who was admitted into Arlington Memorial Hospital for dehydration and a urinary tract infection, and who was later admitted to Kindred Rehabilitation Hospital for a bedsore. Moreover, in the process of admitting my best friend I was given admission papers to sign, but now in retrospect suspect there may have been a Mandatory Binding Arbitration Clause. Nevertheless, I was never given a copy of any document I signed. However, in that case, what I do know is that my best friend was un-necessarily medicated to the point of a medically induced coma. As a result, they did not feed him, but without authorization inserted a feeding tube, gave him steroids and two blood thinners; along with, another drug that also causes bleeding. bleeding out severely, and all day long I begged the doctors and medical staff at Kindred Rehabilitation Hospital to transfer him to Arlington Memorial Hospital Emergency Room which is right across the street—they refused. Consequently, around 8:30 p.m., my best friend who was my father was unresponsive, and to my dismay there was no defibrillator available for them to attempt life-saving measures. Hence, my beloved father, a Medicare/Medicaid patient bleed-out and died. To date, I have not been able to obtain my father’s death certificate because Kindred Rehabilitation Hospital has not filed or recorded it with the City of Arlington, or, Texas Department of Vital Statistics. I would also like to mention that Kloe my service dog was God sent and has done an outstanding job and has been a tremendous help throughout this ordeal—she saved me. Please note, that if I had not fed my father and inserted a feeding tube, given him steroids, and if I had given two blood thinners; along with, another drug that causes bleeding and allowed him to bleed to death I would be in jail. Needless to say, I am re-traumatized all over again, because (as mentioned) I was my father’s primary caregiver. I witnessed my father’s death and it was nothing I could do to help him. Consequently, it is a sad day in America that I served my country since I was 18 years old, and yet, my father had no medical staff including doctors to care enough to let me save my father’s life by answering my pleas to transfer him to the emergency room across the street. I ask how can they continue to receive federal and state funds? These doctors and medical staff took an oath to save lives so how could they just stand by and let my precious beloved father die for no good reason? This is not an attack on all medical professionals or providers, and, it is in my personal opinion that there are excellent hospitals, doctors, nurses and other medical staff who give quality care to all their patients. However, at Kindred Rehabilitation Hospital my father did not receive the quality lifesaving treatment that he deserved. [Sergeant Kericia E. Smith, United States Army, and Army Reserve; Disabled Veteran; Face to Face Interview, Thursday, September 15, 2016; 4:30 p.m.]. This is a heartbreaking and touching story. Conversely, as I was writing and recounting her pain it is easy to visualize this scene taking place in the hospital, because for those of us who have lost a parent or both parents we understand grief– but not this way. Moreover, perhaps there is someone who can attest to this type trauma, or, those people who have experienced the trauma firsthand and know the full picture. Hence, here I will recount to highlight some of the facts Sergeant Smith mentioned so that we all will understand better the plight Sergeant Smith and her dad suffered at the hand of medical professionals who take an oath to save the lives of the people they treat. Renamed Kindred Healthcare in 2001–Vencor (1998), was one of the nation’s most prominent healthcare companies, however, the company has a shady and elusive past and is due for a background check if you are considering this source for your loved ones. Kindred Healthcare Corporation is the largest healthcare company in the United States with a net worth of $7 billion (See: Kindred Hospital Annual Reports). Accordingly, Kindred Healthcare works under a plethora of venues, such as, post-acute services; including, transitional hospital care, short-term rehabilitation, skilled nursing, home health, long-term care, assisted living, nursing facilities, palliative care and hospice. Medicaid and Medicare fraud is a crime, according to a Wall Street Journal (1998) report, and also there is mention of an Attorney General filed suit against the company; and, in January 2016 a press release reports a sister company is reprimanded to pay $125 million dollars (Read: Nation’s Largest Nursing Home Therapy Provider, Kindred/Rehabcare, to Pay $125 Million to Resolve False Claims Act Allegations). Claims escalate among many law firms concerning assault, abuse, neglect, and death (See: KINDRED HEALTHCARE INC LLC v. CHEROLIS). Company buys home of chief executive while patients lack adequate care (See: SUNDAY EDITION | Purchase of executive’s home becomes expensive ordeal for Kindred Healthcare). Vencor/Kindred’s long history of wrongdoing seems to always survive and thrive due to Medicare fraud which only adds insult to injury with the loss of my father. If these Medicare fraud cases were known to the public then our loved ones would be less likely to be put at risk. Kindred seems to look at ‘profits over patients,’ and our lives are worthless because Kindred medical staff is reckless with our medical care. Additionally, any other business as unethical and abusive would have gone out of business decades ago, yet, Kindred continues to thrive on recklessly committing Medicare fraud. Why has the Department of Justice not been more aggressive at informing the public about Kindred’s record of bad behavior? It is the case, that Kindred decayed decades ago from the inside out, and this should send a stench up our noses because the carcasses of our loved ones are not collateral damage and the loss of life should cry out for justice. Nevertheless, we are told ‘If you see something to say something!’ Consequently, I did see something, and I said something, but they did absolutely nothing! It is absolutely appalling! Kindred Rehabilitation Hospital had NO Defibrillator! I am Sergeant Kericia E. Smith and I approve this message—over and out! [Sergeant Kericia E. Smith, Electronic Communication, September 21, 2016; 5:31p.m.]. What Is a Medically Induced Coma and Why Is It Used? Please stay tuned for more detailed information concerning Kindred Healthcare facilities the Tort Reform and Medicaid/Medicare Fraud (False Claims Act). Kayla Dailey, is a prolific writer whose aspirations include hope of encouraging those who face trials and difficulties in life through the written word. As a student of the word she writes, Kayla has earned a Bachelor of Arts Degree in Journalism and Mass Communication from Ashford University, and holds, a Master of Arts Degree in Organizational Management with specialty in Public Administration. Mrs. Dailey is an advocate for civic and community building issues, African American liberties, equal employment, and now veterans and their families; as well as, advocacy against domestic violence for women, children, abortion and other issues people face. © Copyright 2016. The Dailey Grind. All Rights Reserved. Everyday Boston is a multi-media project that breaks stereotypes by using stories to connect people. Your Sunday Bread: Keeper of the Flock? Or Feeding on the Sheep? Oh, I get it why people are offended. I get it that we do not understand the true definition of what it means to be a keeper of the flock, because if we did we would understand that a keeper of the flock does more than stand around, but actually does see the sheep they watch over. In other words, a guide and a teacher. For example, Bereshith [Genesis 4v.2] depicts Abel as being a keeper of the sheep, that is, one who cared for his flock and one who looked fondly at his flock. So out of that the people we get are Shepard and or shepherdess, pastors, herdsmen, companions and those who entreat. When someone entreats it means that we are earnestly begging those within hearing range (for example) to retreat and turn back from a danger point. If that makes sense, then see that the place or danger point in under disguise of the sheep keeper, can devour and eat those who they are supposed to be keeping. It is a strange thought that Strongs H7462 brings out that our beloved pastors could actually to be your friend, and someone called to keep the sheep. Further, the word springs forth that is more specific for these positions as scripture points prophetically and tells us “Woe unto the shepherds that destroy and scatter the sheep of my pasture! saith Yahuah” (Yirmeyahu [Jeremiah] 23:1). So then we understand why people are speaking out against this blatant attack on the flock and ask people opposed to sound reasoning of scripture to prove what you say with not quotes, but through actual teaching what that scripture means if you can. This is not an occasion of offense when someone explains a scripture more in depth research than we have had ears to hear, or rather explained to us. Consequently, people are more attracted to titles than in set apart teachings. Pastors go to seminary schools and are trained on hand movements, body language and all those displays of outer appearance to engage their audience. and in class are taught languages such as Hebrew. In that one should ask why are they learning Hebrew for their flock only to follow an English text, and this begs the question of how if your pastor has studied Hebrew does he not know that Yahuah, not god has a name. This is why people are offended when someone other than those title pushers disturbs the nest. The broad gate is the church and those who follow it are headed for destruction. Take heed.